IBF super flyweight world title holder Jerwin Ancajas (30-1-2, 20 KOs) barely retained his title belt with a twelve round split draw against Alejandro Santiago Barrios (16-2-5, 7 KOs). The scores were 116-112 for Ancajas, 118-111 for Santiago and 114-114 for the draw. Some experts, like Andre Ward and Timothy Bradley, believed Santiago was the winner, according to Boxing Scene. Judge Marshall Walker saw it 10-2 by rounds (118-110) for Santiago. Judge Michael Tate favored Ancajas at 8-4 by rounds (116-112). Judge Chris Wilson (114-114) had it very close with Santiago winning round twelve to get a draw. Santiago won the final round on all three scorecards. Wil EscoI of Bad Left Hool favored Santiago: "Ancajas would get hit over and over again by a looping Santiago right hook and couldn’t really make any adjustment to stop it. 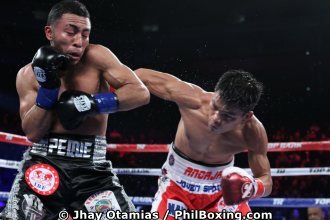 Meanwhile Santiago showed his craftiness and heart, and took advantage of Ancajas propensity to focus solely on throwing straight shots which earned him a 115-113 win on my unofficial card." "It was a good, entertaining fight. My timing was a little off. He was a little awkward," Ancajas said. "I felt like I pressed the fight and did enough to win. I still want all the champions at 115. Nothing has changed," Ancajas was quoted by ESPN. ESPN Senior writer Dan Rafael saw the fight to "essentially came down to battle between the southpaw Ancajas' straight left hand and Santiago's overhand rights." Instead of a rematch, Ancajas will seek a fight with WBC superflyweight champion Sor Rungvisai. He will go to Thailand to watch him defend his title against Iran Diaz on October 6 and forge a unification bout. But Sor Rungvisai most likely will fight a mandatory rematch against Juan Francisco Estrada. "Everyone saw the fight, and everyone saw that I won the fight clearly," said Santiago from Tijuana, Baja California,. The 22-year-old Mexican fought his first 12-round bout, delivered a very vibrant feat despite losing his promoter, Hall of Famer Don Chargin, who died earlier on Friday at age 90. Santiago began focusing on his boxing career after becoming a Taekwondo black belt at age 12, and made his pro debut at age 16. His favorite boxer is Floyd Mayweather Jr., but experts said his style is more aggressive than the unbeaten American. "I thought Jerwin did enough to win, but in a draw he still gets to retain the crown. Overall, a good, spirited effort from both men," said ABS-CBN boxing analyst Atty. Ed Tolentino. "Santiago has that slippery style that Jerwin might want to avoid next time," he said. Santiago said Ancajas' team underestimated him because of his not so impressive fight record. He feels he won the fight but he still respected his champion foe. "We're talking about a great champion, six defenses is not easy. I'm not gonna take credit away from him, he's a great champion," said Santiago. "We worked very hard in the gym and thanks to God ... we got a good result tonight.